CARACAS, Venezuela (AP) — It's a humble place, tucked along a noisy street in a Caracas slum that overlooks Venezuela's presidential palace far below and, beyond, the towering Avila mountain. 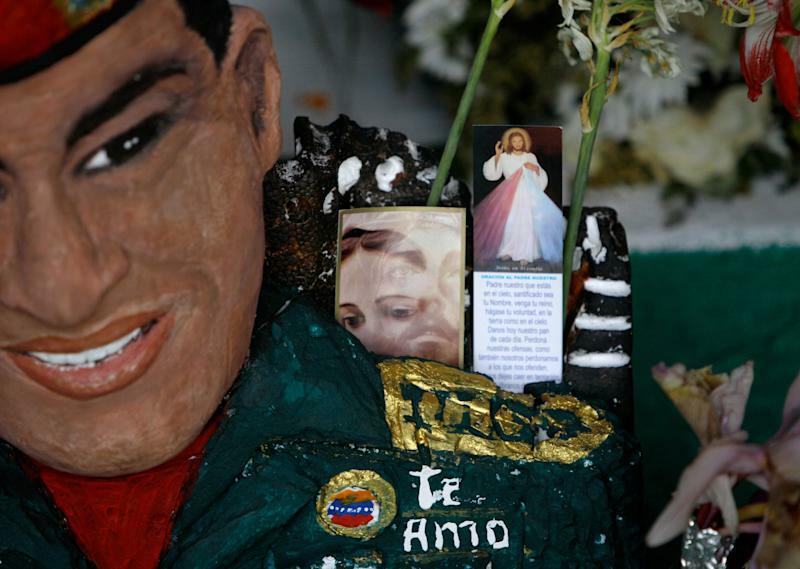 This people's shrine — its name, "Saint Hugo Chavez del 23," inscribed in white paint — has been visited by tens of thousands of Venezuelans to pay homage to a president for some, a saint for others. Beneath a simple tin roof, there are sunflowers and votive candles, their dried wax drippings a testament to the many who've come since Chavez died of cancer on March 5. They still come to the 23rd of January barrio, just steps away from an army barracks used by a young Chavez, then an army paratroop commander, in a failed coup attempt on Feb. 4, 1992. 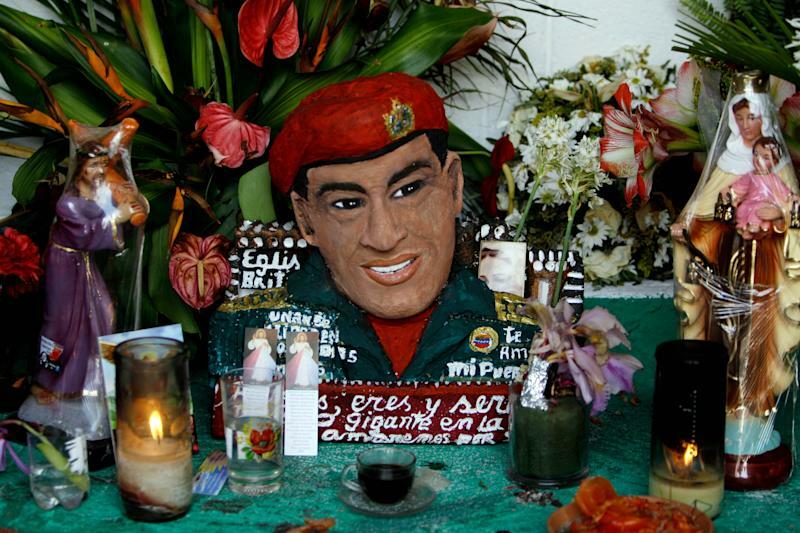 On a wall is a poster showing Jesus Christ bearing a crucifix, paired with Chavez, in uniform and red beret, saluting. "God is with us. Who is against us?" it reads. Venezuela's Roman Catholic church has objected to comparisons of Chavez to Jesus Christ or descriptions of him as a saint. No matter. There are no such objections here. "He is our saint of the poor," says Eva Garcia, 45, who tends to the shrine each day after her shift at the local municipal offices as a community organizer. Elizabeth Torres, 48, a mother of six, places a tiny cup of freshly brewed coffee on the ground before a small statue of Chavez. The late president famously sipped, and savored, cup after cup of coffee during his frequent marathon speeches to the nation. "It's because of that that I bring coffee for him. Every day. And from the heart," Torres said. 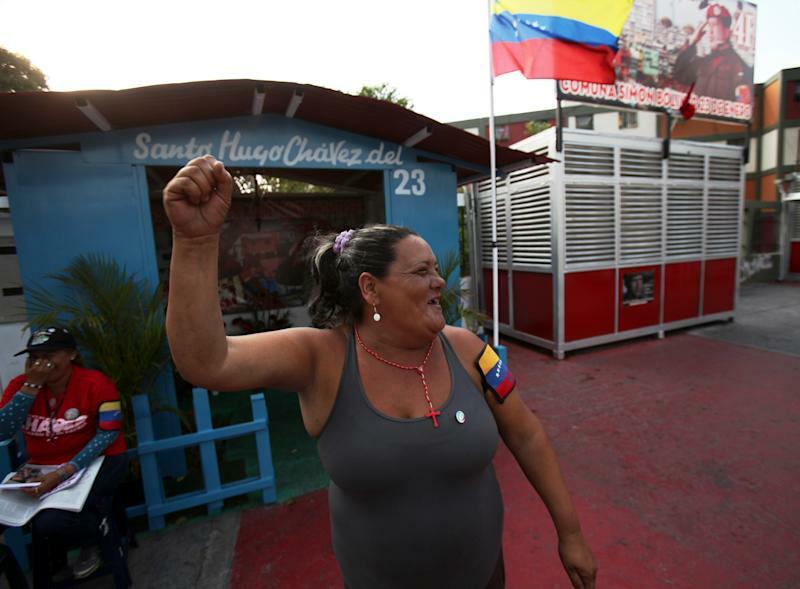 She briefly dances to music blaring from a passing truck that urges residents to vote for Chavez's chosen successor, Nicolas Maduro, in the presidential election. Blue, yellow and red Chavez earrings, and a red rosary adorned with Chavez's face, bounce on her frame. "He's still our supreme commander," Torres says with a relaxed smile that suggests that the initial trauma of Chavez's death has passed, and that the memories — and his social programs — endure. She wears a "4-F" armband to commemorate Chavez's failed uprising. "4-F" also adorns the army barracks nearby. "The fourth of February was the day Chavez began opening our eyes," said Garcia. To each and every visitor, Garcia hands out a copy of Chavez's official agenda for the 2013-2019 presidential term he won't complete. She also offers a handbill with Chavez's last public remarks in December, in which he named Maduro his chosen successor. In 1992, Chavez's coup attempt against President Carlos Andres failed. He famously appeared on television to tell the nation that his movement had failed — "for now." Jailed for two years, Chavez set out on a path that delivered him to the presidency in 1999 and, perhaps, changed Venezuela for good. "When Chavez that day said 'for now,' he really meant forever," Garcia said. "He opened our eyes. He taught us about revolution, socialism, ideology. Chavez lives."